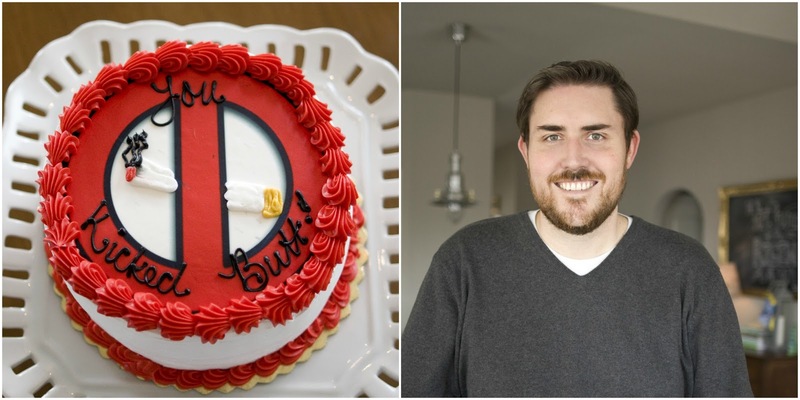 So that's the second post this week with the word "cake" in the title. I clearly have a problem. 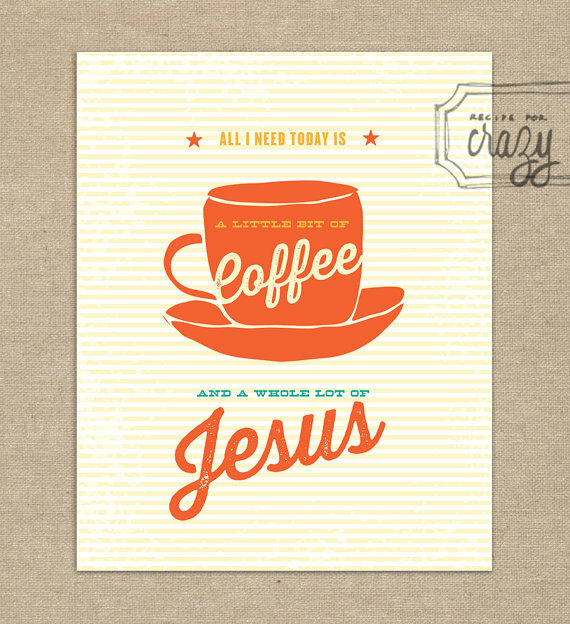 But have I mentioned we're excited for Easter!? On Easter Sunday we have family coming over for a little dessert party. We're not doing the huge traditional Easter dinner on Sunday this year. But I have to say, I'm really excited for an easy, low key get together. 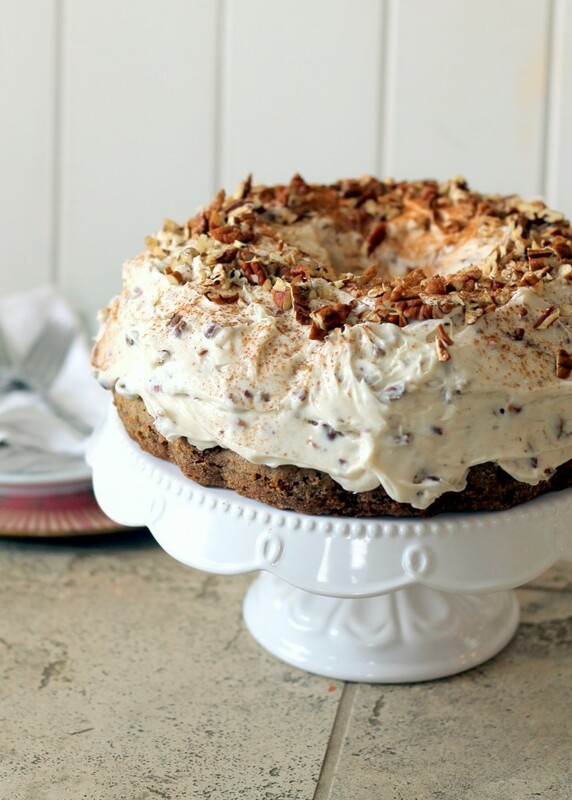 Everyone is bringing some kind of dessert and I've decided to make this carrot cake recipe. I know carrot cake isn't for everyone, but I LOVE it! And this recipe seems pretty fail-proof! This recipe looks delicious as well. So I decided to add a few touches of spring decor to freshen up our abode. 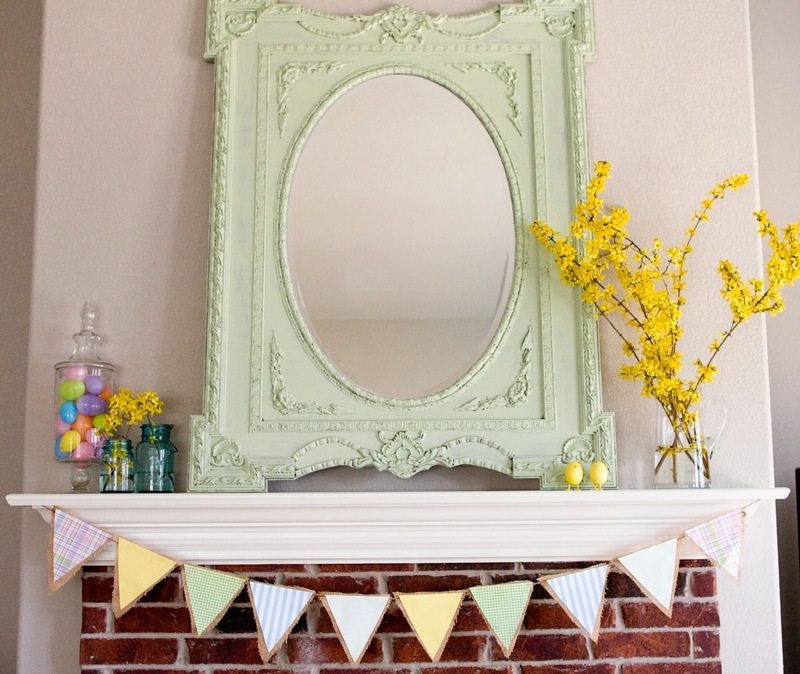 Again, I just love spring colors and having fresh flowers around makes me a happy girl. I plan on adding some fresh tulips before the weekend. and Forsythia from my mom's backyard. So easy! 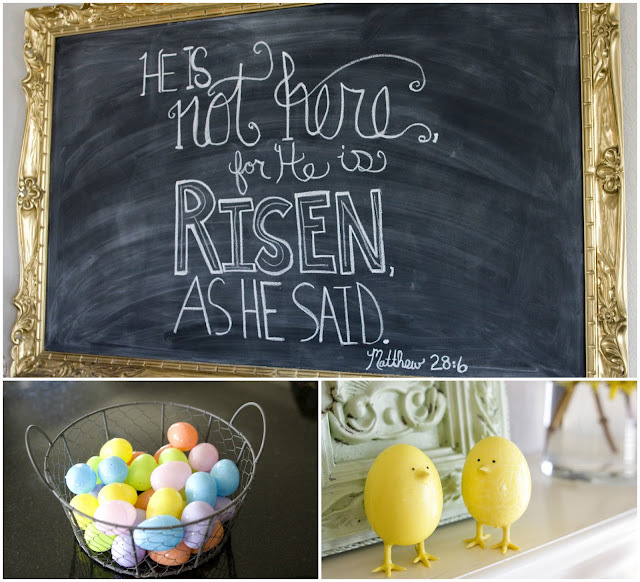 My diy chalkboard with my favorite Easter Bible verse, more eggs, and cute little chicks from the Target Dollar Spot. 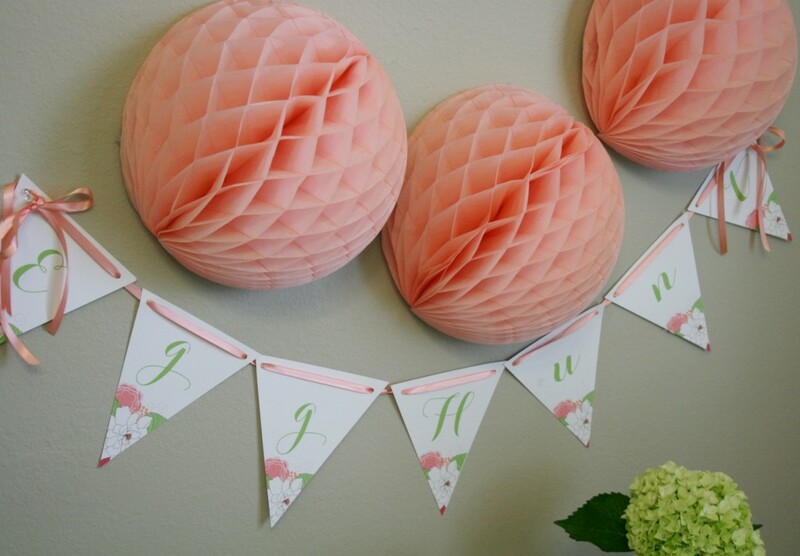 And I think I'll print off this adorable banner to hang by the dessert table. Love these colors! I have always LOVED Easter! 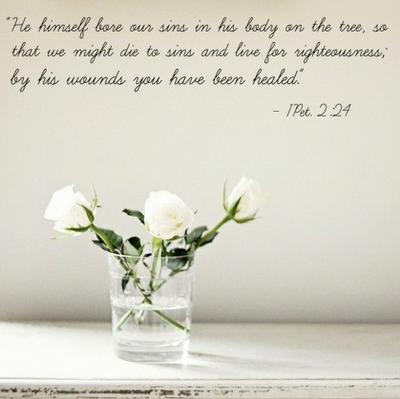 A day to celebrate the Resurrection of Jesus, first and foremost. I can't wait to teach Henry what Easter really means! 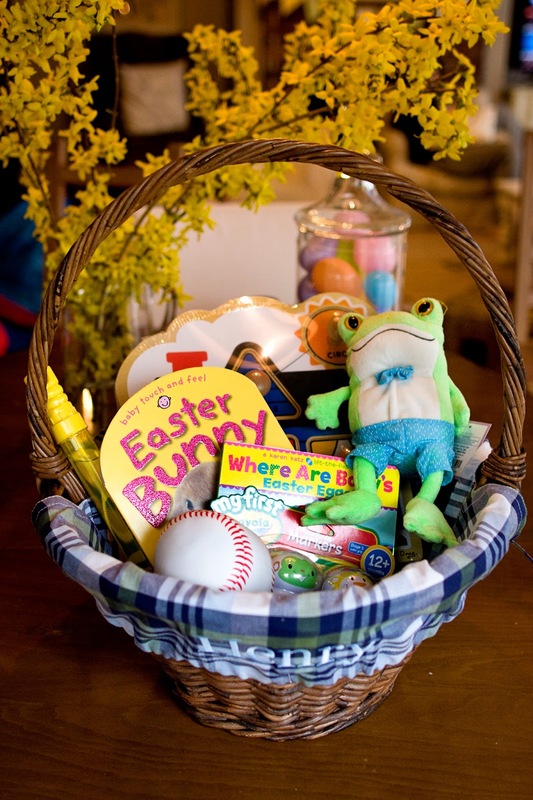 Here's what the Easter Bunny is leaving Henry this year. Little Man is obsessed with books, this one is super cute. Where is Baby's Belly Button is his favorite, so I'm sure he'll love this! Love Melissa and Doug Toys. He has another and I can't believe how well he plays with it! 5. Bubble Wand, Squishy Baseball, Frog - All cute little things I picked up at Target. 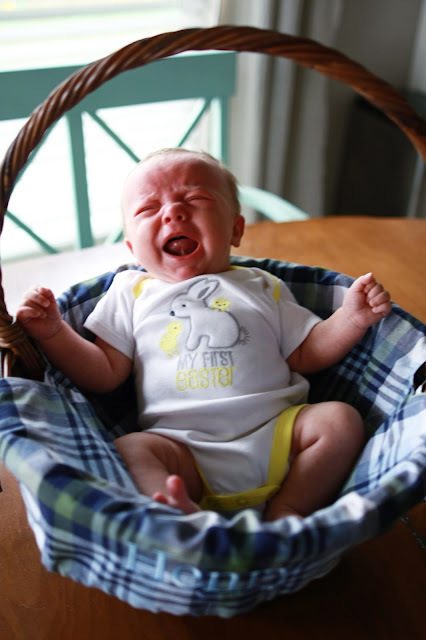 Just one month old, his first Easter. We are officially ready for Easter! Linking up with The Good Life's Easter Basket Blog Hop! I hoped for a low key weekend and I got it! It was so great having Shawn home all day to help with the little monkey. He is becoming quite the toddler lately, and his little (or big, actually) personality cracks us up. We just chilled the rest of the day at home and had a yummy dinner and watched Skyfall. Sunday morning we headed to the mall for Easter bunny pictures. Total Fail. We even tried for another round after we grabbed some food. He was not having it, He cried as soon as we sat him down. But I may try again next week. 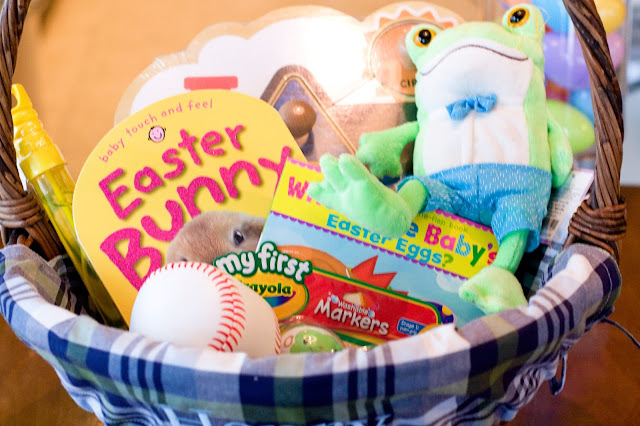 Before Easter Bunny. After Eater Bunny. The highlight of the weekend was this amazing cake. That's right- my main man has been smoke free for a whole year! This called for cake, obviously. We had some family over and celebrated Shawnie's HUGE accomplishment- we are so proud of him! Henry is a little rowdy these days. But tries to apologize with a hug. Noah wasn't feeling it. We finished off the weekend with some much needed Mexican food. Yes, we had cake and then ate Mexican food. Don't judge. It was my cheat day. Hope your weekend was great, as well! Happy Monday! That's what we've been in the McCutchin household. And unfortunately, blogging took a backseat to the rest of life's happenings. When I would finally get some free time to blog, I'd feel like there was so much to document that I'd just get overwhelmed and say forget about it! Sorta like the massive amount of clean laundry that keeps growing instead of being put away. So one thing at a time. Let's start with this week- Spring Break! Things got pret-ty crazy around here, that's what spring break is all about right? For example, one night I stayed up until midnight watching three episodes of Parenthood, whaaat!? Crazy, I know. Seriously though, probably my favorite show these days. I started by watching this past season as it aired, and now I'm going back and starting from the beginning. 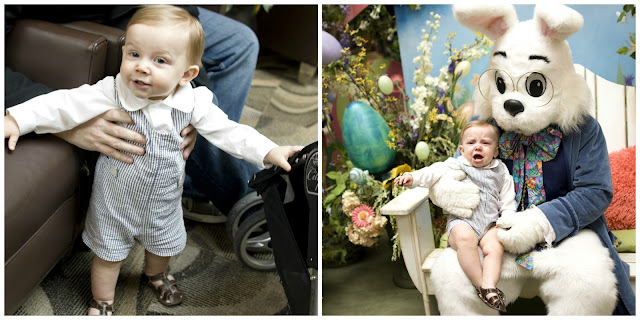 Also this week, Henry and his best friend Griffin got their model on for some Easter pics. We still need to hook up with the Easter Bunny for their annul photo sesh. Next week, hopefully! Shawn and I filled out our NCAA brackets! My first time, can you believe it?! 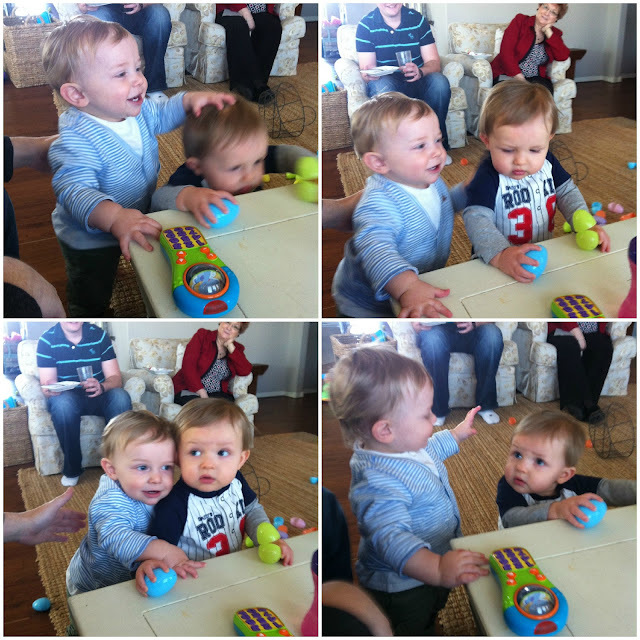 Today started out with a play date with Henry's bestie and Cousin Noah. So happy we bought a bounce house for Henry's party instead of renting one. The boys had a blast and good naps usually follow. I just move a couple of chairs around and it fits in the living room- perfect for this gross, cold weather we're having! We also had to take my car in for some repairs, so that was fun! So, needless to say, I'm looking forward to a little down time! Loving this cute quote I just found on Pinterest. 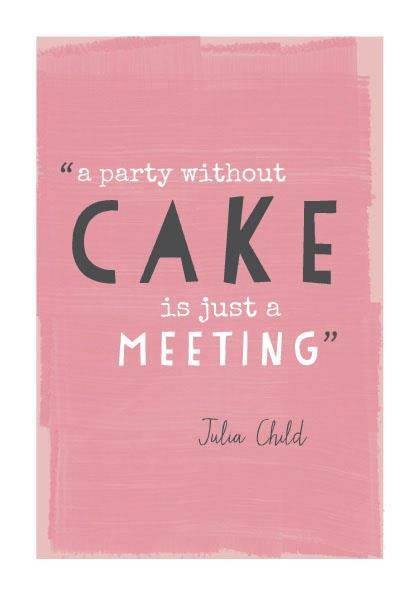 I love anything Julia Child! 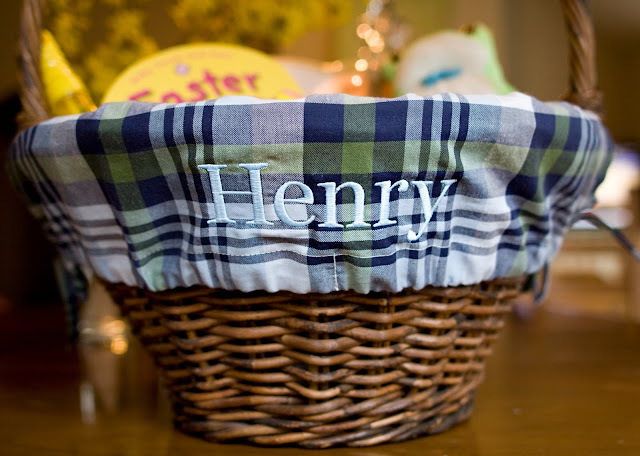 Next week I promise some posts involving Henry's first birthday, his birthday photo session, Easter pics, Easter basket goodies, and who knows what else. Random is my middle name. It feels good to be back, friends. Thanks for sticking with me! I know, I know..... I've been gone a bit too long around these parts. I'd love (and plan) to get caught up! So much has happened since my little break- Christmas, New Year's, I TURNED 30!!! February has me buried in party planning for Henry's 1st birthday party! I am having so much fun planning little man's big day, and possibly over-doing it so I don't have to face the reality that my baby will soon be one. "Buy more cupcake liners to hide the tears! ", as they say. Okay maybe I say that to myself as I spend countless hours on Etsy. Any who, I will try to share a few party details. But today, I thought I'd get at least one of these holidays documented. Here is my little cupid baby wishing you all a Happy Heart Day! I sent these beauties out to friends and family because I couldn't get my crap together for Christmas cards. Hope your day was filled with lots of love!